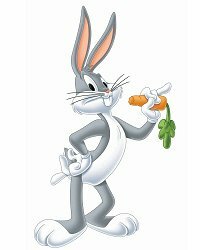 On April 30, 1938, make its first appearance one of the main characters of the Looney Tunes and Merrie Melodies group: "Bugs Bunny". Born from the Leon Schlesinger Productions staff (now Warner Bros), by many fathers: Ben "Bugs" Hardaway (who created a first version in 1938 for "Porky's Hare Hunt"), Bob Clampett, Tex Avery (who developed the definitive personality of Bugs in 1940), Robert McKimson (which created the definitive graphic appearance), Chuck Jones and Friz Freleng, the fathers of the Looney Tunes. Dubbed always by the great Mel Blanc, his first appearance in the character we all know today was in the episode "A Wild Hare" on July 27, 1940. In the group of all the characters is the one with the strongest, most fascinating character and the one that always comes out victorious from every clash with each of its counterparts. This peculiarity is the work of Chuck Jones, which found the perfect way to make Bugs sympathetic by making sure that its antagonists repeatedly used threats, blunders and misconduct but never succeeded in their intent. Not for anything else, its name, "bugs", is synonymous of "crazy".